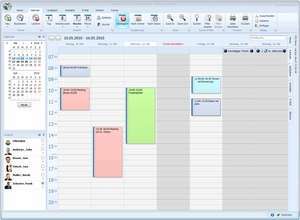 Working as part of your team, Pimero is a convenient appointment calendar and task list manager - the ideal companion for small teams and individuals. With its automatic, serverless synchronisation you need not give a second thought to how you maintain your appointments up-to-date. With its multi-user capabilities, you have the perfect tool for team-work. Display the appointments of colleagues next to one another - easily and clearly. Pimero 2014.R2 is a shareware program and can be used as a demo to try the software until the free trial period has ended. A full version of the program is available after the trial period ends. For security reasons, you should also check out the Pimero download at LO4D.com which includes virus and malware tests. Additional screenshots of this application download may be available, too.